KenDowns wrote: My current program would best be called "Tribute to Dan John". He's saying: sprint and do compound moves (carry, drag, lift). So all of the body part accessories are out, no more skull crushers, and waiters walks and overhead squats are in. I've got leg press in this cycle and will go ahead and do it, but will likely drop it next cycle in favor of box squats and sumo deadlifts. Squat is kind of special, it's not really any of those. Squat gets a pass. With the meet over, I'm going solo for at least 10 weeks and then will resume with Sam (most likely). He was very aggressive and we would attempt to push all lifts forward at a time with heavy volume. We found this worked up to at least 5 weeks. As the main lift got heavier and weeks passed on, I would rebel at the end of 5 weeks, chalk up my PR's, and demand a deload. This does not mean I could not have gone further, just that it wasn't fun any more after that point. I'm in it for the fun, so that's important. Week 5: 2/PR. Main lifts at a double that would be a PR, anything I want or don't want on accessories, like deload is starting already. In the event that your single word was not an imperative voice form of "to elaborate" and instead was the adjective "elaborate" meaning "marked by intricate and often excessive detail; complicated." then, uh, ok.
Ken - just seen on the PB thread that you done a competition. Well done!! I'm planning to do one in March, and already getting nervously excited about it. Also, our gym got a leg press recently and i've been amusing myself on it. I have felt lower back discomfort using it, and shortly after using it. Something I never feel when doing squats or DL's, so you're probably right. KPj wrote: Ken - just seen on the PB thread that you done a competition. Well done!! I was nervously excited for 3-4 months. In case it does not show on the video, I had the time of my life, went 8/9 and set two pr's. There's really nothing to describe it. KPj wrote: Also, our gym got a leg press recently and i've been amusing myself on it. I have felt lower back discomfort using it, and shortly after using it. Something I never feel when doing squats or DL's, so you're probably right. Yeah, the only other possible culprit was a super heavy triple DL I pulled, which I have not done in a long time. But THE INTERNET says those machines will make you sore in a bad way. I'd like to complete this cycle with it, which means once more on Saturday, so I can measure any potential gains in the next cycle, but even if it added 20# to my squat, I might ask myself, "at what cost?" Seems like a lot of trouble and second-guessing for a machine that's supposed to be safer, you know? KenDowns wrote: I was nervously excited for 3-4 months. In case it does not show on the video, I had the time of my life, went 8/9 and set two pr's. There's really nothing to describe it. It definitely showed! Made me want to do it even more, too. You know, i've been trying not to think about it much. Been trying to slowly, sensibly and patiently get my strength back this year. My "indicators" indicated I was on course to get strength back early so I slowed things down even more and trying to get in shape, be in balance, get rid of all niggles etc, then there's usually a competition in March - so start training for that in January. That way I have less time to do something stupid and get hurt again. Now it's time to prepare to prepare, ya know. So the nerves are kicking in. I now have the attitude of wanting a day like you had - getting most if not all lifts, and having a great time, then take it from there. Some PB's would be a bonus, though! Also have a client who wants to compete with me, so we'll hold each other accountable. KenDowns wrote: Yeah, the only other possible culprit was a super heavy triple DL I pulled, which I have not done in a long time. But THE INTERNET says those machines will make you sore in a bad way. I'd like to complete this cycle with it, which means once more on Saturday, so I can measure any potential gains in the next cycle, but even if it added 20# to my squat, I might ask myself, "at what cost?" Seems like a lot of trouble and second-guessing for a machine that's supposed to be safer, you know? haha, i'm doing exactly the same. Truth is, I don't "like" the Leg Press, I don't rate it, and I don't recommend it. However, I've never gave it a fair shot. So here I am. I've had 2 proper sessions on it, and counting. Like you I had planned to stick with it until I improved significantly on it and see if there's any carryover. The occasional credible PL type recommends them i.e. Wendler. Other than the fact that, well, it's a leg press, and the slight back discomfort, I actually enjoy it. I like doing crazy things on it. I do it at the end of squat day and work up in sets of 10 until I can't get 10 reps, then do a drop set back down to one plate per side. I enjoy being able to push so much without worrying about technique breaking down. I guess I missed the link to the video. Is it on Youtube? If so, I can't get it. I'd be interested. Doc, is there any video site you can see? or any file exchange site you have access to? If not, I can put up a simple page where you can d/l the video. I put it into the Personal Best Log thread originally. Hmmm, I've never done this before, do I need to explicitly share it to you? If so, send me an IM with your account. What I need is for you to put it into MY dropbox. That way it will download slowly whenever our network isn't doing anything else. We have a firewall with very strict settings that blocks almost any video sharing site. If you PM me with your email address, I'll send an invitation for you to "join" a folder, and you can put the video there. The vid came through just fine. It was fun to watch! Thanks. Ken, come meet day, how do you feel when it gets to deadlift? On Sunday I done a mock-meet of sorts. It was supposed to be next week when it would of been more ideal and we would of been more prepared but, still, I was humbled. 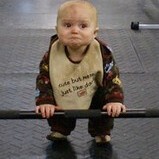 Even going for the bench after the squat, I felt like just assuming the fetal position and going to sleep. By the time the deadlift came I was a zombie! The girl who is competing with me felt the same, if not worse. Was actually her deload week, so she maybe had more of an excuse, although I went balls to wall on deficit DL's a few days before which wasn't the best. But we wanted a worse case scenario anyway. We done this over about 2.5 hours, too, though, but it made me think, and gave me a whole new appreciation for what it takes to max out on all 3 in one day. I'm guessing you know more about peaking than I do, but my trainer did the classic approach, giving me a few weeks of 5's, a few weeks of 3's, and then a lot of singles before taking a few days off. The whole thing lasted 8 hours, but I'm counting from breakfast, adding one hour. Thanks for the info, it's reassuring! By the time deadlifts came I felt like I hadn't slept for about a month! Although, deadlift was the only lift I was happy with. Raging with my squat and had to hold back a little on bench as i'm at tail end of an injury. However the flat foot and pause kills me so not sure I would of had much more. How is going from your warm up sets to your attempt? I suspect it wouldn't exactly be ideal, and you could be standing around waiting to be called, not wanting to do too much, but not wanting to cool down. In the gym i'm used to working up to heavy sets, taking jumps I'm used to taking. Did you find this a bit hectic? I'm going through a process of over thinking, as you can probably tell. Nervously excited. Still trying to decide training for it, was going to stick with a classic linear basic/boring approach but i'm still over complicating things. I'll have my moment of clarity soon, i'm sure.